I'd like to introduce you to a creative individual who comes from the world of design and merchandising. Jamie Godfrey's background as a home products designer for Ralph Lauren and Martha Stewart, has given him the inspiration to create a line of handcrafted products under his own brand. 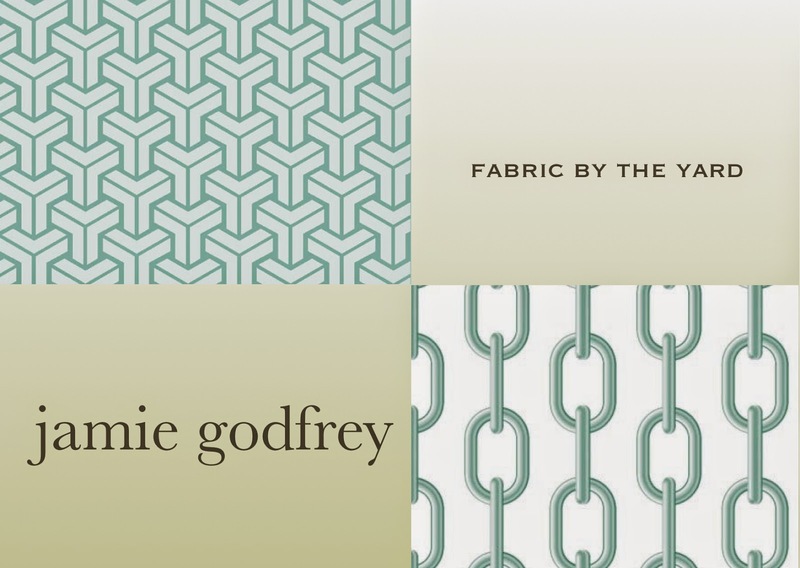 The assortment of textiles, candles and published novels are available through his website, Jamie Godfrey. His product line of home goods introduces us to Jamie's personal style, which I find to be fresh, crisp and quite pleasing to the eye. Jamie offers us beautiful, and thoughtfully designed, fabric by the yard through his Etsy Shop. His color palette is one that I instantly connect with, as I'm sure many of you will too. The soothing color of celadon in a Y pattern is suited for many uses throughout the home, such as bed linens and upholstery. The celadon-colored chain pattern can also be used for upholstery, but it can successfully be utilized for table linens if you choose the linen/cotton blend of fabric that Jamie offers. 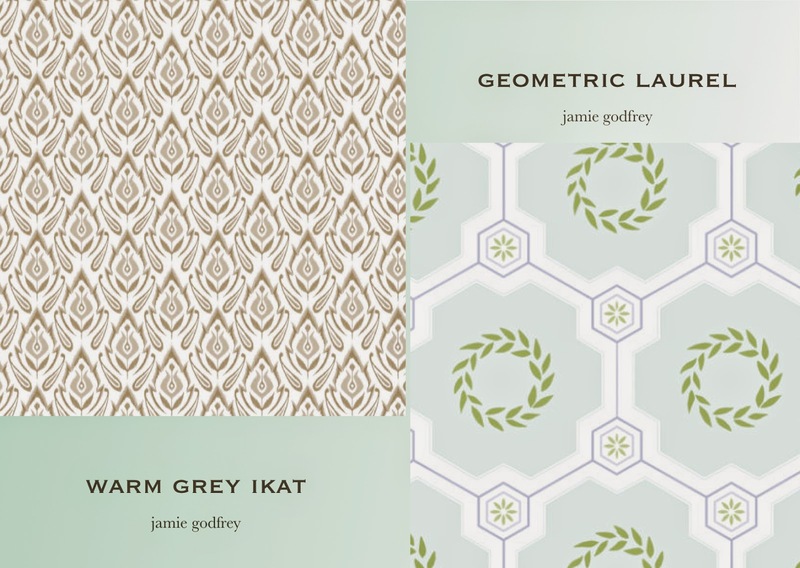 Geometric Laurel and Warm Grey Ikat are among my favorite patterns created by Jamie. They're chic and sophisticated, while maintaining a good balance in color and composition. 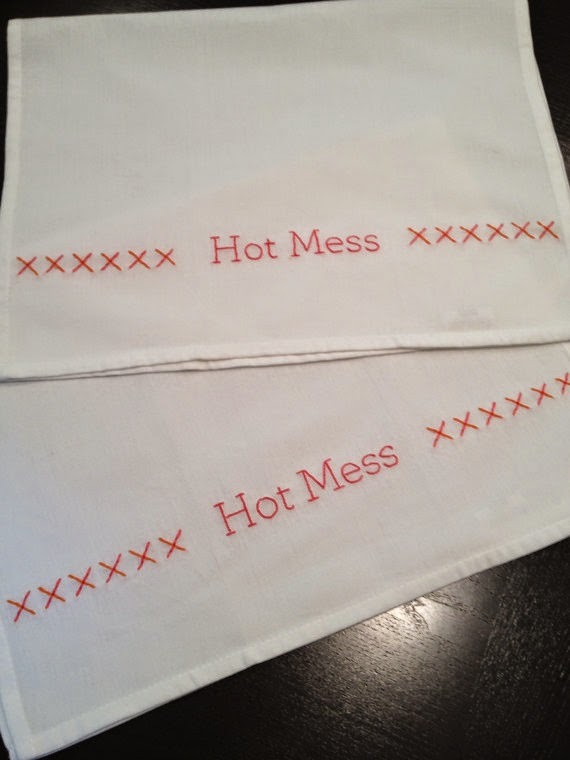 As a baker and cook, I can appreciate the idea of feeling like a "Hot Mess" sometimes. These hand-stitched kitchen towels are suitable for any kitchen. A bit of humor and whimsy is always welcome in the kitchen. 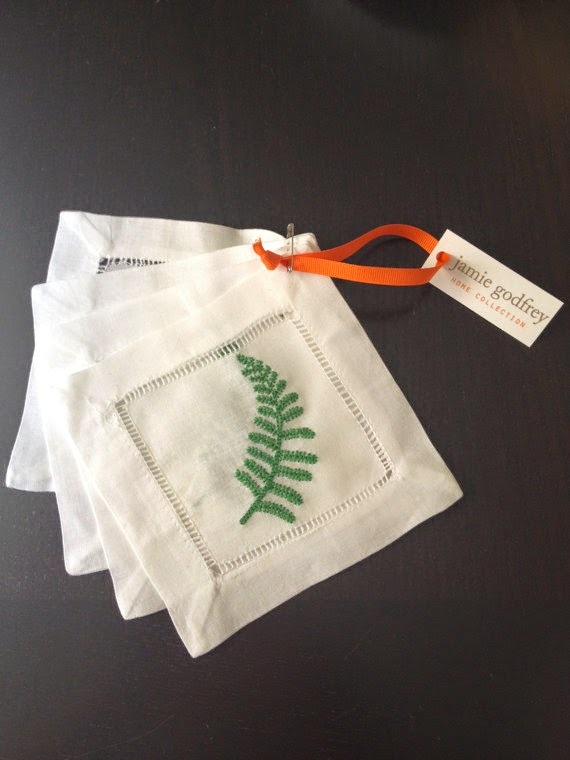 Hand-embroidered Fern Cocktail Napkins will be conversation pieces at your next gathering. The wide hemstitched border gives these napkins that touch of elegance, but it is the embroidered fern which makes these extra special. Let's not forget Jamie's candles! 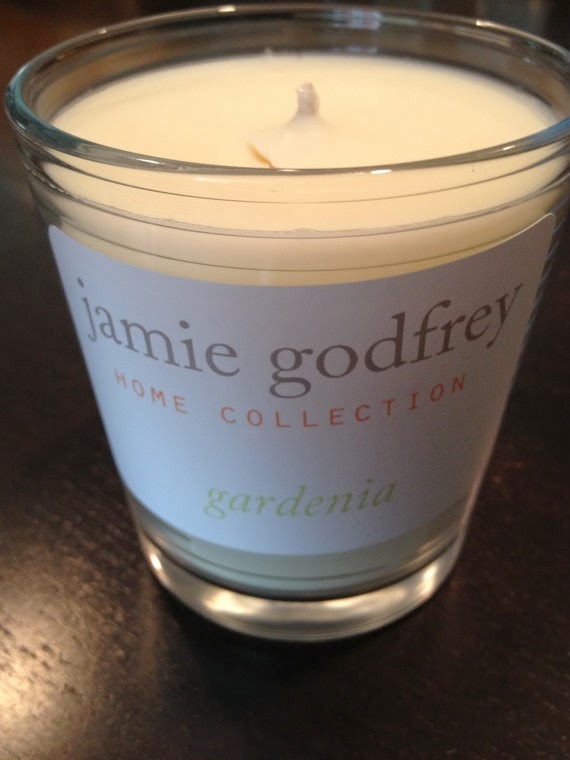 If you love the warm, beguiling scents of gardenia, lavender or say red currants, let Jamie's collection of handmade candles grace your home. It is through Jamie's website, podcasts and recently-created blog, that he expands on what currently motivates him. Presently, Jamie is on a personal mission to lead a healthier life as he reaches a milestone birthday. His blog is focused on the progress he's making, and yet, Jamie is already looking beyond the goal he has set for himself. Let's face it, we can all do with a little bit of motivation in our lives, no matter what age we happen to be. I decided to ask Jamie a few questions to share with readers, because I thought it might give you the motivation to try something new or give you the impetus to make that change. This is what he had to say. 1. Your began blogging this January. Congratulations! What prompted you to start blogging? The blog was really born as a companion to my podcast. To be honest, I haven't given it the attention it deserves. It started out as a place where I could share visuals and links mentioned on the podcast. It's my goal to grow it into a resource, not unlike your blog, where I can research and share posts on a range of wellness and lifestyle subjects. Stay tuned! 2. I love the Etsy store and your branding. It's clean, simple, yet sophisticated. How did this come about? Thank you! For the better part of my career, I developed housewares that were mass produced overseas. I've always been drawn to items that were crafted by human hands. Years ago, seems like a lifetime really, I taught myself how to sew. I wanted to pick it up again and combine it with my love and experience working in home products. 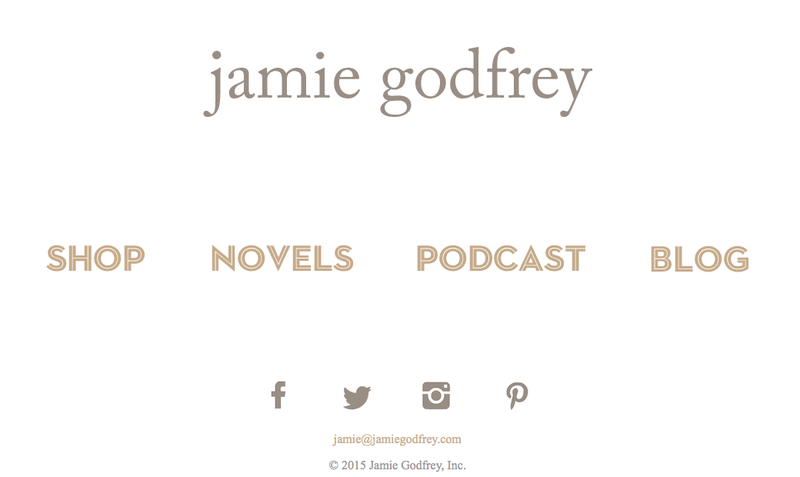 So, the Jamie Godfrey Home Collection was born. I hand-embroider napkins kitchen towels and aprons. I create original textile designs on the computer and have them printed here in the U.S. I hand-pour soy wax candles that are scented with my favorite fragrances. The entire assortment is based on the colors, textures, materials and scents that inspire me. I don't create what I don't love. 3. Podcasting. Is this another creative outlet for you and do you prefer it over blogging so far? For years, every January in fact, I would proclaim that this was the year I was going to get fit. It would last a few weeks and was forgotten about. This January I turned 39. Not very momentous as birthdays go but I drew a line in the sand and said this is it. I'm going to get into shape by the time I turn 40. I had recent finished listening to the Serial podcast and am a regular listener of Jillian Michaels' podcast and thought: what better way to hold myself accountable than by recording a weekly podcast with my progress updates. So, each week, I start with my weigh-in. But that really isn't enough to fill an entire episode with. Each episode has a major topic that I research, explore and write. It's typically focused on wellness, nutrition, and fitness but have done an episode on design. Whatever is really at the front of my mind, I explore. And there are several regular segments that I do each week. My favorite is based off the mantra that Martha told us at MSLO and that is to learn something new every day. So, in this segment, I share with the listeners something I've learned. I'm a lover of random information so this was never a stretch for me. I also have a segment where I focus on whatever it is that week that I am thankful and grateful for. I really look forward to recording the podcast each week. It's like sitting down with an old friend to have a chat. It's definitely one of the bright spots of my week. I love podcasting and blogging equally really. I love that both are limitless in what you can express and explore. 4. I'm curious. What was it like working for Martha? Working at MSLO has been one of the highlights of my career. I got to work alongside people who were the best in their fields, all passionately committed to the brand and the work. That's very rare and nearly impossible to replicate. I wouldn't trade that experience or those friendships for anything. 5. I'm adding you to my must-reads and sources & inspiration page, so that I can follow you. Is the blog something that you only plan to do for your yearlong journey or do you see the blog evolving into something else? Thank you!! I'm very flattered! My initial thought was to go through the yearlong process and see where I am at the end of it and evaluate what direction to take. But honestly, now that I've started, I'm definitely going to evolve both beyond the year mark. I've kind of fancied myself a late bloomer. And this is something that is a major theme on the podcast. Martha herself didn't pen Entertaining until she was 40. I feel like I've had this whole other life and am finally coming into my own. 6. You're a writer! I have yet to read your novels and I can't wait to do so. What authors do you like to read and do you have any particular genres that you gravitate towards? Yes! Having lived and worked and dated in New York City, I had collected more than my share of stories. My friends had long been prodding me to write them down. So, I did. I wish that I could say I had some elaborate, romantic process. It was really a labor of stolen moments. I would draft sections on my iPhone on my commute. Nights and weekends I would continue the work. But, I did the bulk of my writing when I was on flights to and from India and China for work. 15 hours with nowhere to go, nothing to do and a laptop in front of me. I read everything. Classics, best sellers, you name it. I've been reading a great deal of nonfiction and self-help books recently as part of the research for the podcast. Be sure to log onto Jamie Godfrey's website to explore his full line of handmade merchandise, and to learn a bit about his background. Thank you, Jamie, for giving us such great insight. Cheers to you! My youngest nephew is about to celebrate his birthday with friends and family, and this year's party theme will be Paw Patrol. Apparently kids adore these doggie characters to no end! Wanting to surprise my nephew, I made several dozen cookies in bright colors and charming shapes. After scouring images on the internet, I found a few that I wanted to recreate, but I also set about interpreting one of these characters with my own dog design, to put that Good Things by David stamp on them. I kept the representations simple and bright. Perfect for any kid! Your kids don't have to be into Paw Patrol to have these cookies at their birthday party. I can easily see them for anyone who is fascinated with pooches, and for those who are at the stage of wanting to be firemen when they grow up. 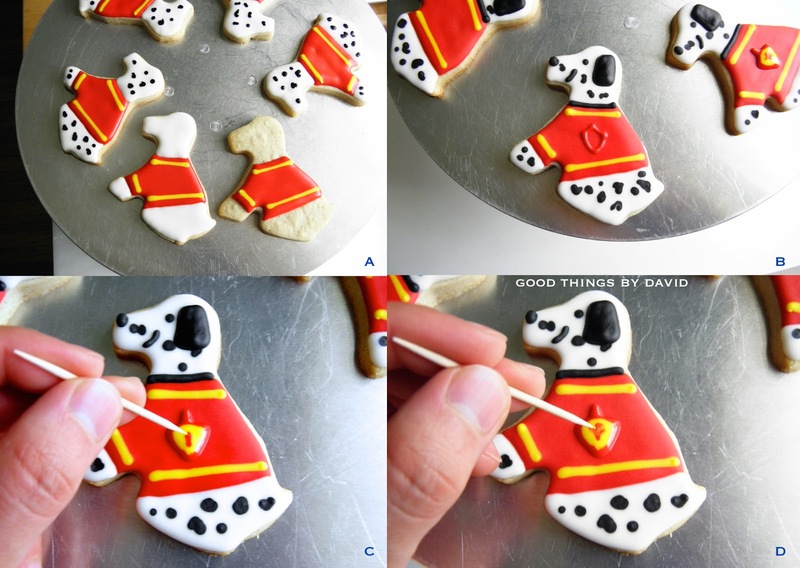 Iced in red, ice blue, bright yellow and white, the Paw Patrol inspired cookies will have everyone pawing over doggie bones, paw prints and firehouse dalmatians. For the dog paws, outline and flood the paw cutouts in white royal icing using a #3 tip, and let dry completely. Outline and flood paw pads in a chosen color on top of the white icing and let dry completely. Easy peasy! 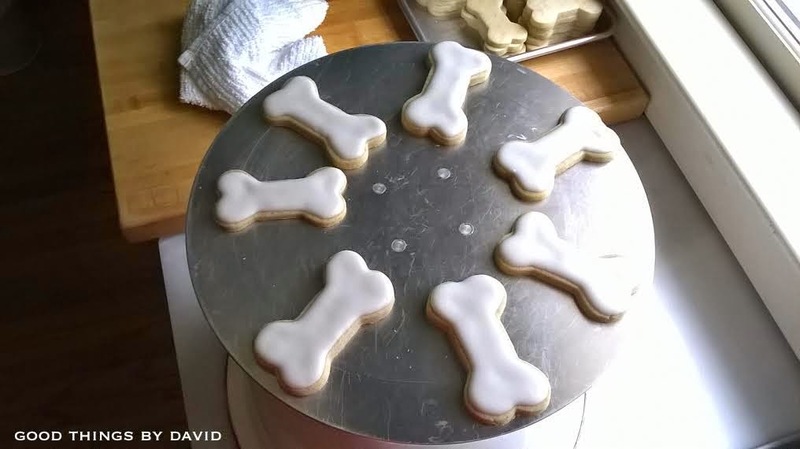 For the dog bones, outline and flood the base of the bones in white icing using a #3 piping tip. Let this dry completely. Outline the shape of the dog bone in a color using a #2 tip. With alternating colors, using either a #1 or #2 tip, pipe paw prints and the corresponding number (or name) of the birthday! Let these dry. The dogs are also very simple to do. A. Begin by piping in red, with a #2 tip, the outline of the firefighter jacket; flood it with the same color. While the icing is wet, pipe yellow stripes along the collar, cuff and seat of the jacket. Using white icing and a #2 tip, outline and flood the dog's head, paws and legs. Pipe black dots haphazardly throughout the body. Let the bases dry completely. B. With black icing, outline and flood dog ears, pipe dots for eyes and a nose, and pipe a small mouth. With red royal icing and a #1 tip, pipe an outline of a fireman's shield/badge on the center of the jacket. Flood the area with yellow royal icing. C. While the badge is wet, pipe a small line of red royal icing down the middle (about the size of a grain of rice). D. Using a toothpick, pull the red icing around to create flames. Let this dry completely. I don't need to remind you that cookies for my family members and friends get baked with extra care and lots of love. These Paw Patrol inspired cookies are sure to appeal to kids of all ages with their bright, cheerful colors and adorable shapes. 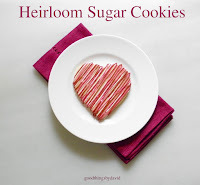 Kids and adults will want to take several home as favors and gobble them up as soon as they can, so I strongly advise you to bake and ice a lots. Package them in cellophane bags tied with ribbons, baker's twine or seal them with stickers. Make them colorful. Make them sweet. Bake them with a lot of love. A BIG Happy Birthday to my little nephew! Uncle David loves you very much! I was recently asked what my favorite spring flower was. Without even thinking twice about it, I responded with daffodils. Daffodils are such beautiful, delicate flowers that never fail to capture my eye if I spot them in people's gardens, at the markets and around my own home. These harbingers of spring really do make me happy with thoughts of what the season has to offer. Spring is all about renewal and turning over a new leaf. After reconnecting with a dear friend of mine and having conversations about moving forward with one's day to day life, I realized that it's the little things that matter. I also recognized the fact that I'm in a very good place in my life at the moment. I have so much to be thankful for, and for that, I am happy. In fact, I am very happy! I've said it before here on the blog that I'm not much of a person who has to have freshly cut flowers in my home at all times, but when I can get something from the grounds of our home that is cheerful and colorful, then I take full advantage. That's just what I did over the weekend. It doesn't cease to amaze me how quickly mother nature begins to pop up all around us this time of year. By the creek near our spring house there is a swath of terrain that is covered with daffodils and ostrich ferns. The ferns have begun to unfurl in earnest, but it's the daffodils that really seem to burst with color. I must have cut at least 5 dozen daffodils this past Sunday, leaving many behind by the creek. Admittedly, they are at the end of their cycle and many are already beginning to wilt. I made sure to cut them so that I had plenty of length to play around with in the vase. If you're going to cut daffodils from your garden, do it early in the morning and have a vessel filled with cool water to hold them in while you prepare to make your arrangement(s). I filled a heavy glass pitcher with cool water and enhanced it with 1/4 teaspoon of bleach and one tablespoon of sugar. It was then a matter of cutting the desired lengths. The shorter cuts were arranged around the rim of the pitcher, so that they drooped over, while the longer cuts were arranged around the middle. Any spaces were quickly filled in. In the container I have a mix of daffodils. These narcissus look wonderful in numbers, especially if they come in a variety of colors. There you have it. An easy arrangement with my favorite spring flower. Daffodils are gorgeous, they are spring and they absolutely make me happy. With so much that spring is giving us right now, I hope that many of you are enjoying these flowers around the neighborhood, in your yard or in your home. It's not a coincidence that I ardently began to collect jadeite several years ago. The color green has always been my favorite color since I can remember, and the tones of my vintage jadeite, along with the variations found in the Martha by Mail jadeite, fit in nicely with my color of choice. 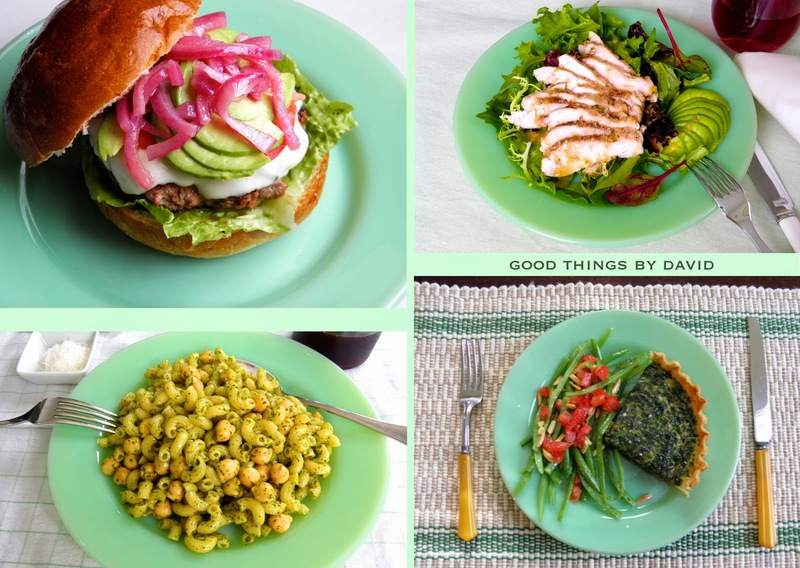 Collectors will probably agree with me when I say that the cool, opaque-green nature of jadeite soothes as well as brightens any kitchen, cabinet or table top. Like those collector friends of mine whom I keep in close contact with whenever I have a jadeite question (they know who they are! ), this glass gets used periodically in my home. It's never far out of reach or tucked away in the attic where it's inaccessible. The glassware is proudly displayed somewhere when it's not in use, and when it is being utilized for a particular task, then it's on the counter. On any given day, I may use one of my restaurant ware cups by Fire King for my afternoon tea, and if I happen to be baking a cake or a batch of cookies, more than likely I'll reach for a set of mixing bowls near my dough counter to set out a mise en place. I scoured my archives for those moments in the past when I used my Fire King or Martha by Mail jadeite to remind you to use your beautiful glass whenever you get a chance to. It doesn't do anyone any good to have it sitting untouched or boxed up in the attic. Take out those wonderful cups or mugs and put the graduated mixing bowls to use the next time you're baking or cooking something. Believe me when I tell you that having your mise en place set in green glass will instantly cheer you up and make your time spent in the kitchen so much nicer. Have a little jadeite moment with me as we sift through the images that I have taken throughout the years and get motivated to use your collection! Cakes sitting on jadeite seem to spark one's appetite and interest while they await the inevitable. You don't need me to tell you that anything chocolate sitting on green glass will have you reaching for seconds. How about a fluffy coconut cake or some freshly baked biscuits, slathered with butter, and kissed with some homemade cherry jam? In order to get fluffy biscuits, you must be quick when mixing the dough and you have to have a light hand. Overworking the batter will result in heavy pucks of inedible stuff, so keep this in mind. My Fire King restaurant ware gets used on a weekly basis. The proportions are just right for afternoon teas or weekend breakfasts. One of my favorite breakfasts is Greek yogurt with some homemade granola. These Fire King berry bowls are perfect for a small portion. 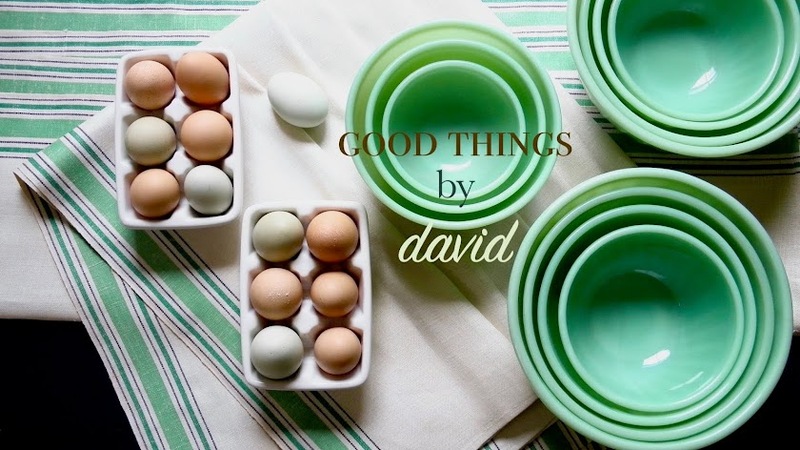 It isn't always the case that I have mixed eggs from the farmers market, but when I do, it's good to stack some on a jadeite platter. The muted blues, greens and various browns look striking against the opaque green. 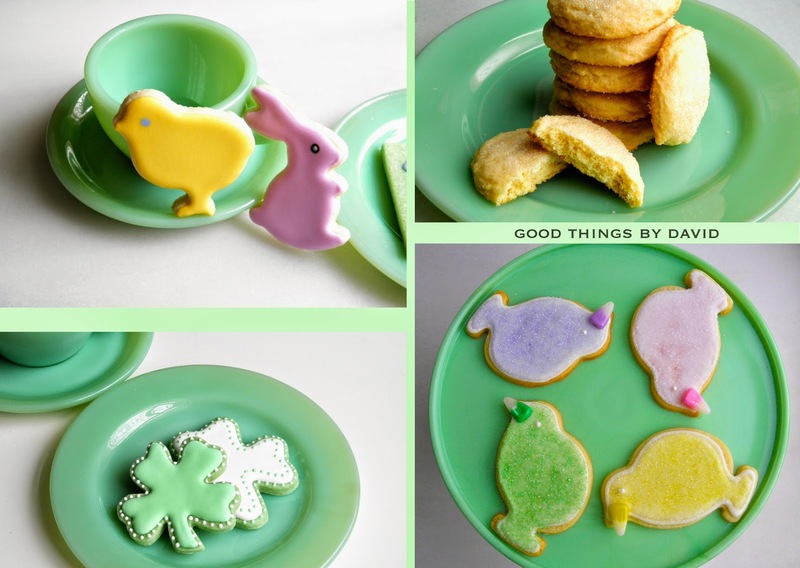 Cookies are naturals when it comes to jadeite. Whether I'm nibbling an iced cookies (yes, readers, I like to keep one or two cookies for myself after a baking project) or a simple sugar cookie, if I'm having tea or some espresso, then I bring out the 1950s Restaurant Ware. Those hatchling cookies on the bottom right are sitting on a Martha by Mail cake stand. 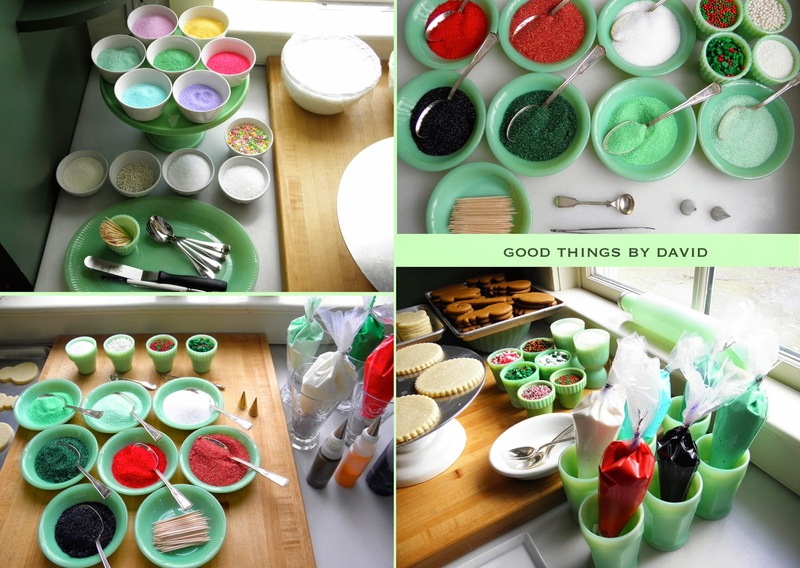 This is what I mean by using jadeite for one's baking and decorating projects. Platters, small bowls and even glasses get employed to help me out in the kitchen. Scooping up some sanding sugar to sprinkle on a cute mitten or say, a Santa cookie, is easy if I have these ingredients out. Yes, I know. There are such things as pastry bag holders that keep bags filled with icing upright, but I don't need to add more to my pantry, so why not use what I already have? Old Ball jars look so handsome next to jadeite bowls. These are always within easy reach for me. See what I mean? 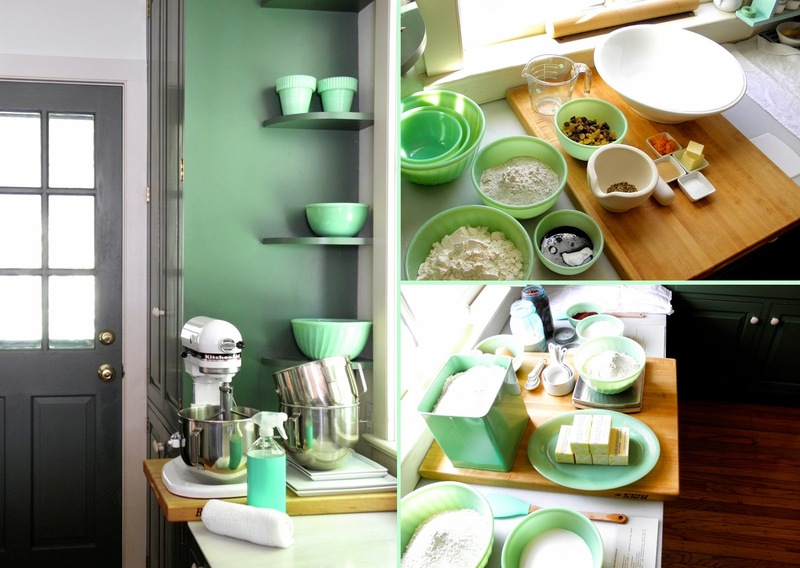 That pantry at the end of the kitchen has some corner shelves that are just right for a handful of bowls and other jadeite pieces. If I'm making pumpernickel breads or some other kind of sweet stuff, I simply reach over. The 9" dinner plates from Fire King's restaurant ware line are used weekly. A burger hot off the grill will sit nicely on one of these plates. If I'm having a light lunch of sliced chicken salad or a hearty homemade quiche, the Fire King plates are brought out from the cabinets. One of my stacks of restaurant ware dinner plates show you how well they look in numbers. Hefty enough to use every single day, they're also great to use for special holiday meals and brunches. This is a portion of my Fire King restaurant ware that I adore. By the way, if you happen to have these Fenton tumblers do consider using them for other things, such as flower arranements, desserts (think berry fools and floats), and of course, for holding icing bags. 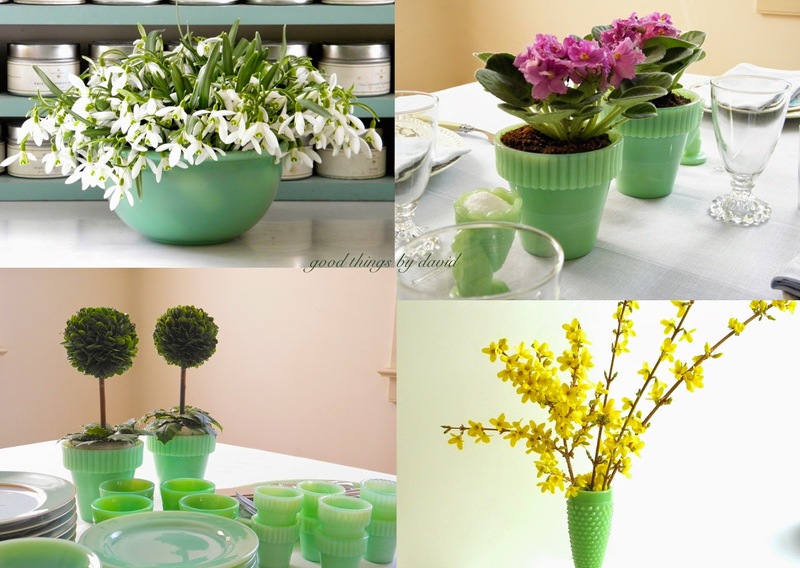 Speaking of flower arrangements, bowls, Fenton flower pots and hobnail vases in jadeite make any arrangement special. I love bringing in my snowdrops every single year and amassing them in bowls or pots. African violets and some boxwood topiaries are understated, elegant and great for table settings. 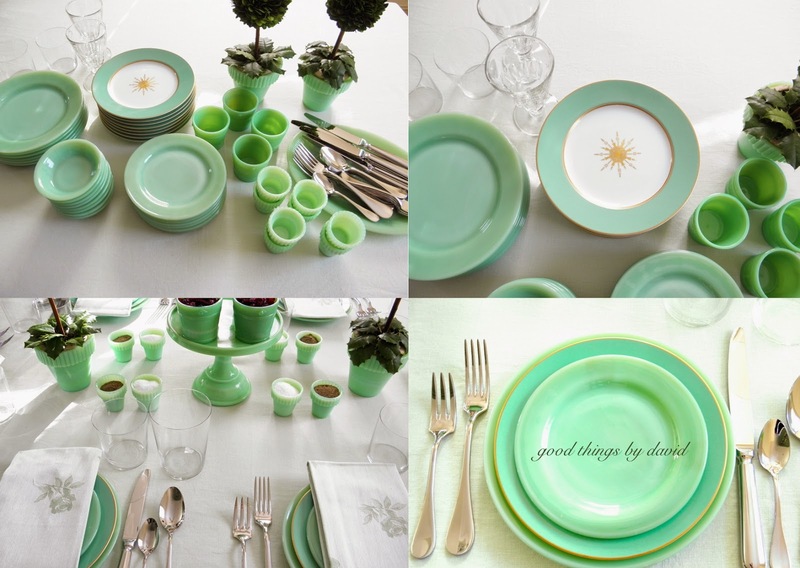 You don't need me to tell you that a Christmas table set with jadeite looks phenomenal. Mix and match the pieces that you own with other porcelain or earthenware, and then add nice silverware (I used a French baguette pattern) and some pressed linens. Those Antique Star Plates are among my favorite accent pieces for table settings. 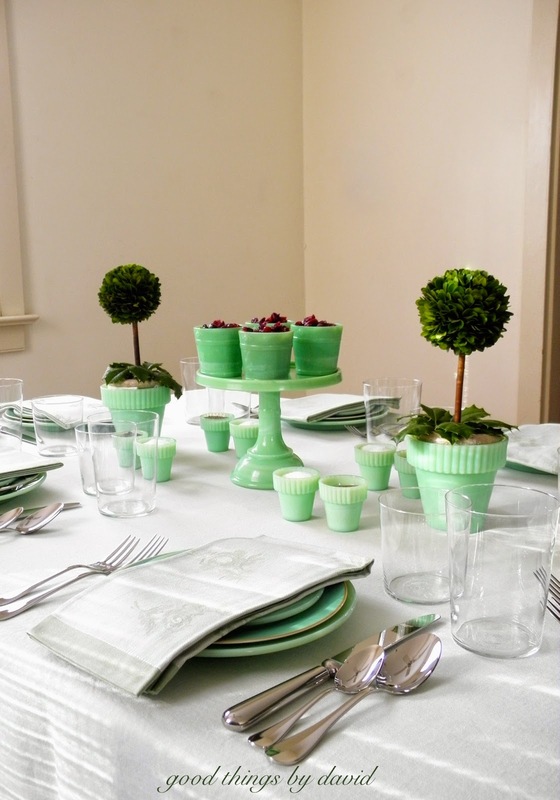 Any holiday table will be elevated to something quite memorable if you use your jadeite. I have a thing about finding new ways to present my salt and pepper at the table. Small flower pots and egg cups are just some of the things that get put on the table for this purpose. I don't need to reach into my drawers of antique cut-glass salt cellars if I want to use some jadeite. Having said that, I also like to keep different salts and peppers near my stove for seasoning. Practice what you preach! Although those enamelware pet bowls (top right) aren't technically jadeite, they are wonderful Martha by Mail additions that were gifted to my kitty cats by my dear friend, Kenn. 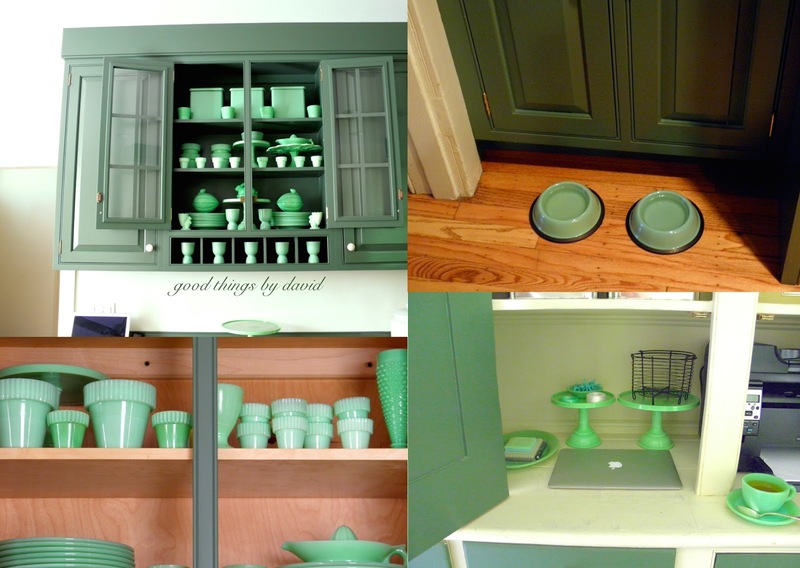 As you can see, jadeite has spilled over onto my office space and some nearby cabinets. This metro shelf in the attic holds my L.E. Smith cake stands. Jadeite is but a small portion here. Have your jadeite stored and organized so that you can easily locate pieces and not have to dig through your glassware just to find something. It's up to you whether or not you add felt rounds in between the stacked jadeite, but I highly recommend it. 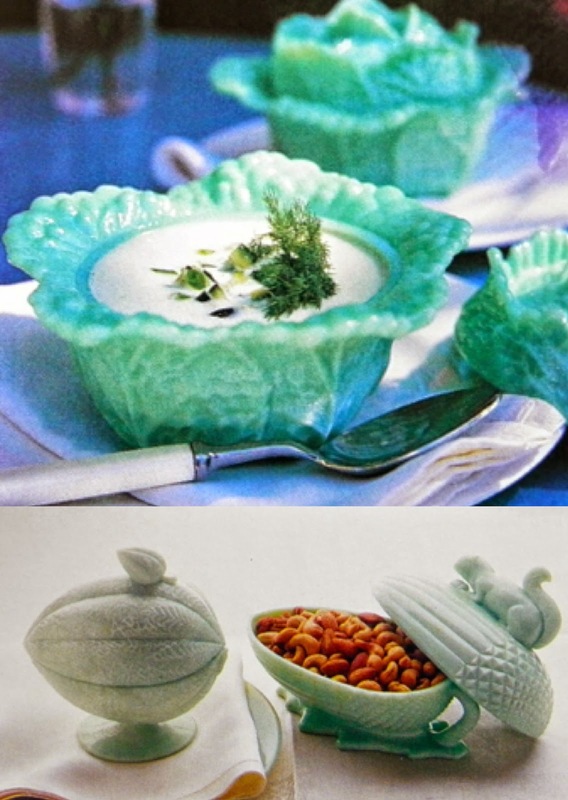 Collectors of jadeite already know that the secret to enjoying this gorgeous glass is to use it often. 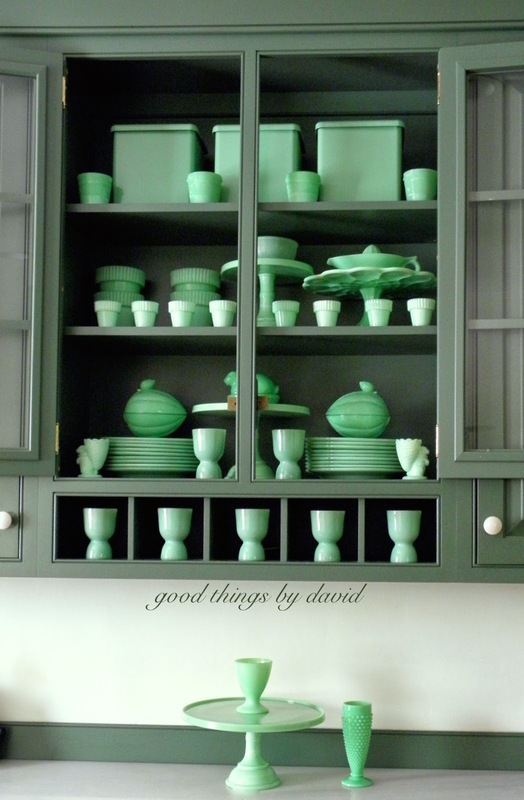 Think outside the box and put your jadeite collection to use throughout your spaces. 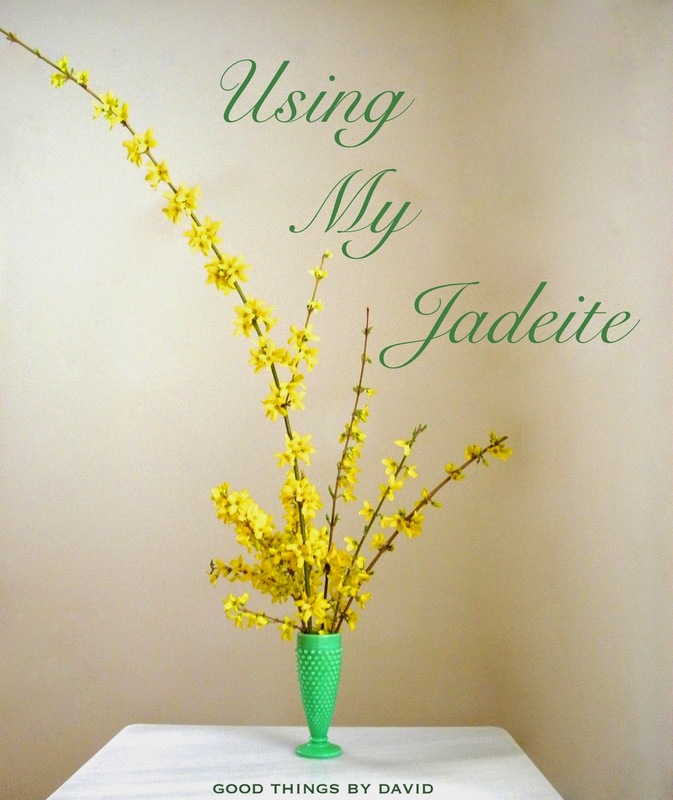 An office, bedroom or even a bathroom will benefit from a few pieces of jadeite. This exquisite glass instantly brightens any area it happens to be in. My hope is that this overview of how I like to use my collection prompts you to take advantage of your existing jadeite assortment. Martha's Green Glass encompasses a very time-specific collection of glass that was produced exclusively for the Martha by Mail catalog from the late 1990s through the end of 2004. It is an assortment of glass for the home instantly recognizable by ardent collectors of jadeite, because of the unique shapes, markings and color variations. Martha's Green Glass was created for Martha by Mail by three of this country's most distinguished glassworks: Fenton, L.E. Smith and Mosser. There are those who feel that the introduction of jadeite through Martha by Mail, flooded the jadeite collectors market, which has since caused confusion among budding collectors. This, along with the introduction of the Fire King 2000 line, continues to irk some collectors and vendors; once you get familiar with what was produced when, it isn't all too difficult to distinguish what is what. Others will tell you that the variations in color for this product line don't agree with their current collection of Fire King, McKee or Jeanette glass from the 1940s, 50s and 60s. I agree that there is a clear difference in color saturation and color flow found throughout the Martha by Mail product line, but to my mind, it is what makes them collectible. Moreover, the fact that Martha's Green Glass was produced by glassworks in the United States for a very short period of time, furthers the notion of its desirability. The glass itself is substantial in weight and quite durable, making it ideal to use every single day. It's incredible that there isn't much out there written about Martha's Green Glass. A few books have small mentions of the Martha by Mail jadeite, including the 'Jadite: An Identification and Price Guide', and the only online resource of good, reliable information which discusses this glass can be found by clicking here. Although I do collect this glassware passionately, I don't own every single piece. 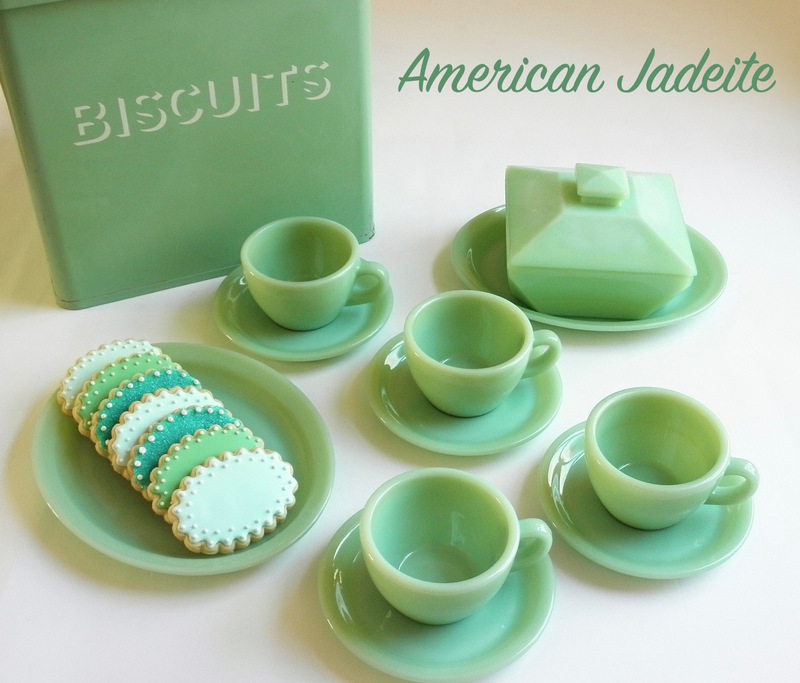 Even so, I feel that certain jadeite pieces were overlooked when the designers were planning the merchandise. A set of green glass nesting mixing bowls would have been wonderful additions, as well as some canisters to hold foodstuffs on the counter. Cups and saucers or perhaps some mugs, to my mind, could have been added with great success. 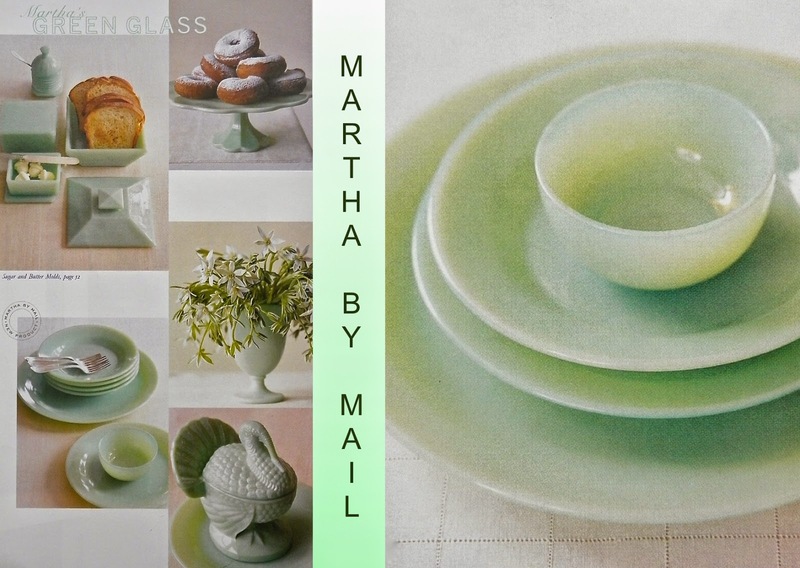 Let's go through the many images found in the former Martha by Mail catalogs so that collectors and would be collectors can become familiar with the style, color and shapes of Martha's Green Glass. It's important to know what you're potentially bidding on online or are purchasing at an antique's store. Oh yes, Martha's Green Glass has found its way into the 'antiques' market already and it is commanding quite a mark up. NOTE: Keep in mind that I may not have every single piece that was offered from Martha by Mail on display here. Moreover, there are some images in this post that are shown as examples of the glass item in a different color, such as pink & milk glass. Many jadeite pieces were not marked, but those that were will have Martha by Mail (all caps), MBM, Fenton or an 'S' (this for L.E. Smith) somewhere on the vessel. I asked a couple of collectors to tell me in their words why they started collecting this jadeite. 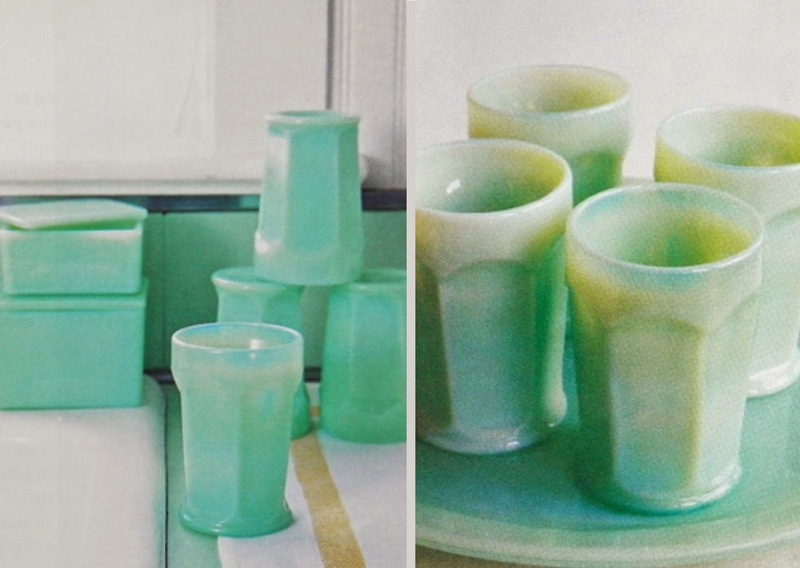 Kenn states: I started collecting Jadeite (primarily Fire-King) after seeing the cupboards in Martha’s studio filled with the milky green glass. My collection was growing by leaps and bounds when Martha introduced “Martha’s Green Glass” through the Martha by Mail catalog. I immediately knew I wanted to add many of these pieces to my collection. What I liked about the Green Glass collection from Martha by Mail was the unique designs. The cake stands had a traditional look, yet were also quite modern. The covered dishes (rooster, turkey, acorn, and others) were pieces that had a bit of whimsy – but were adaptable to a well set table at holiday time. I always found the Green Glass collection to be sturdy and well made. Much to my surprise, being rather loyal to the deeper jade color of the Fire-King line, I liked the slightly lighter color of Martha’s Green Glass as well as the slight color variations within an individual piece. Several of my pieces have slight ‘swirls’ of color (typically on the underside of the piece) which only adds to the unique nature of the glassware itself. For me, outside of the love of the color, it was about the design of the line, and the quality of the line. As each new Green Glass item arrived in the mail, I was never disappointed. Years and years later, the same Green Glass has held up quite well and is still put into frequent use. Kevin writes: When these pieces were introduced in the Martha by Mail catalog, I was impressed by their quality, weight and proportions. They were priced less than what I was paying for original jadeite pieces (which has skyrocketed due to Martha's influence) at antiques stores, and made a nice addition to my Fire King collection. The photographic glossary above, shows a small sampling of what was offered. Variations in sizes among some of these pieces, such as small, medium & large flower pots, fish dishes and leaf plates, are common. These dainty egg cups were used by the catalog to hold candies, tiny bouquets as well as other items. The pressed glass, footed eggcup (3) came as a set of 2. The bunny egg cup was pressed from a 1950s mold. A breakfast tableaux shows the iconic jadeite covered rooster sitting on the large 13" round platter. The covered honeypot is to the left, and below that is another round platter with four of the 5" bowls. Wedges of honeydew sit on the 8" soup plates, which are stacked on top of the 9-1/2" dinner plates. The small flower pots being used for egg cups measure, 2-1/4" high and came as a set of 4. Martha by Mail: Covered dishes with animal themes were popular from about 1880 to 1910 and are very collectible today. Our modern versions are ideal for servings of soups or dessert, side dishes, or candy and nuts. Covered dishes played a large part of the Martha by Mail jadeite collection. 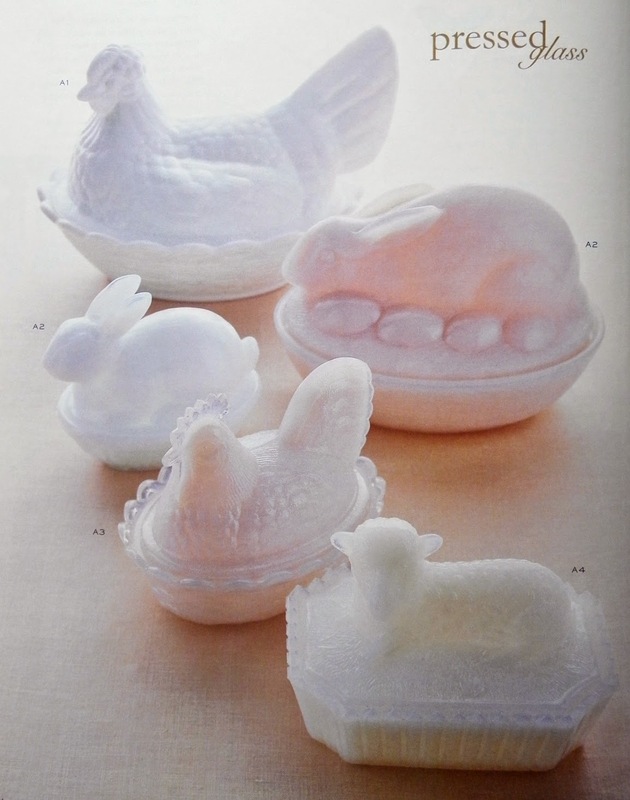 This Easter table shows white milk glass bunnies (these were made in jadeite) and a covered hen dish, as well as pedestal vases. Here is another photograph showing the Hen Egg Plate/Dish and the large 8-1/2" long covered Hen Dish. The ranunculus flower arrangement sits on the Pedestal Vase. There aren't a lot of photographs of the covered Cabbage Dish which was introduced at the beginning of 2001. The dish measures, 7"W x 4" H with a 4" diameter bowl underneath the lid. The covered Melon Dish (lower photo) is sitting next to an a covered Acorn Dish with sugar squirrel. The latter measures, 7-1/2" x 6" x 4" with a 12 oz. capacity. Perfect for a spring celebration are these covered bunnies. The larger bunny has ears that rest along the body of the bunny, and is surrounded by a nest of eggs along the base of the lid. The smaller bunny has upright ears, and seems to be perched a bit higher up. Both bunnies have basket-weaving along the base of the bowls. This is another fine photograph of the Hen Egg Plate & Hen Dish. The dishes A3 & A4 are examples that I haven't seen quite as often as those in the A2 group. A3 is known as 'Little Chicken' and measures 5-3/8"L x 4-1/8"W x 4"H. The adorable A4 dish is known as 'Spring Lamb'. The recumbent lamb lid sits atop a picket fence base. The dish measures 5-3/8"L x 3-7/8"W x 4"H.
A single ice cream scoop sits inside the bowl of the small bunny. Here are other photographs showing the faceted tumblers, as well as the covered boxes. 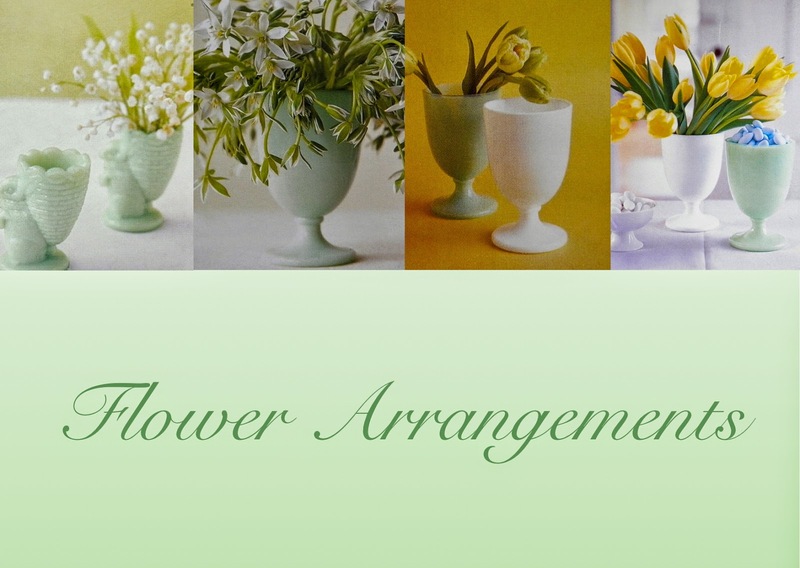 We can't show Martha's Green Glass without mentioning flower arrangements. Throughout the years, Martha by Mail displayed an abundance of flower arrangements using their jadeite pieces in new & unusual ways. The photo above shows you some examples. A trumpet vase can be used for so many different arrangements, but the grouping of hydrangeas here is perfect. The trumpet vase measures 6"H and holds up to 30 oz. The small dish next to the vase was sold as a 'Salt Dish' and came as a set of 2. Those measure 7/8"H x 3-1/8"W.
The stack of three L.E. Smith cake stands (8", 10" & 12") have honeypots (without the lids) and the votive candle buckets. To the right you can see the faceted Fenton tumblers. The tumblers were sold by the glass or as a set of 4. The 'Bucket Votive Holders' were sold as a set of 4, measuring 2-3/4" x 2/-3/4" each. The catalog states, "these charming votive holders resemble little wood buckets- right down to the tiny groves in their "planks". Here is a perfect example of how varied the color can be in each piece of Martha's Green Glass. Swirls of pale green mixed with the jadeite are very common among certain pieces. This 'Faceted Jug' was made by Fenton and measures 6"H x 7" from spout to handle. This is the very collectible 'Pressed Glass Basket' made by L.E. Smith. "The heirloom-quality basket is made of substantial hand-pressed glass using a 1940s mold. The basket has a feather design, creating a scalloped edge. Weighing just under 7lb., it makes a sturdy vase when used with a flower frog." The basket measures, 7" x 13" x 10-1/2"H.
A hobnail vase was turned into a bedside table lamp for the catalog. "The shape of an antique pressed-glass vase appealed to us so much, we wired it to make a lamp; we are pleased to offer a replica to you. Perfect for a bedside table in a guest room or nursery. Stands 16" tall; silk shade has a 10" diameter." This unusual dish is called 'Pressed Glass Bunny Plate'. It was offered in pink (shown), jadeite and milk glass. It measures 6"L x 4-5/8"W x 1/2"H. States the catalog: Use this detailed plate as a butter dish or a spoon rest. The 'Grape Leaf Dish" came in two sizes, small (8-1/2") and large (11"). "Serve cheese, fruit or hors d'oeuvres on this delicate grape leaf. Pressed from the original 1936 mold." The table setting here confirms the jadeite color spectrum that is common for the entire Martha by Mail Green Glass product line. The Grape Leaf Plates are among the lightest in color, while the Scalloped Cake Stand runs on the darker side. As a collector of this glassware, I find it extremely fascinating to see these distinctions. Here is a fine example of the Scalloped Cake Stand. "Modeled after a vintage stand in Martha's collection, this stand adds a decorative flourish to cakes and other desserts. Fluted base stands 4-3/4" high and the plate is 11" wide. 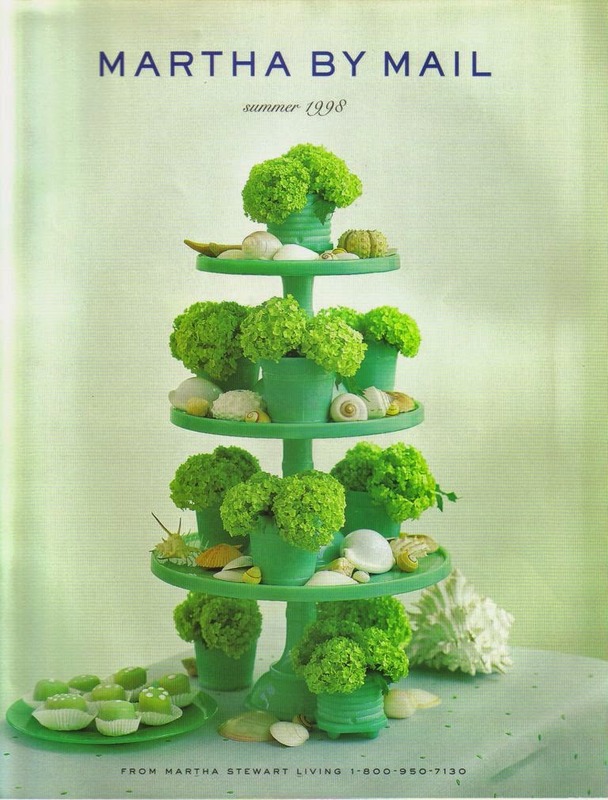 Used to introduce Martha's Green Glass, the cover of the summer 1998 issue of Martha by Mail, has a stack of cake stands, along with bucket votive holders and beehive honeypots. 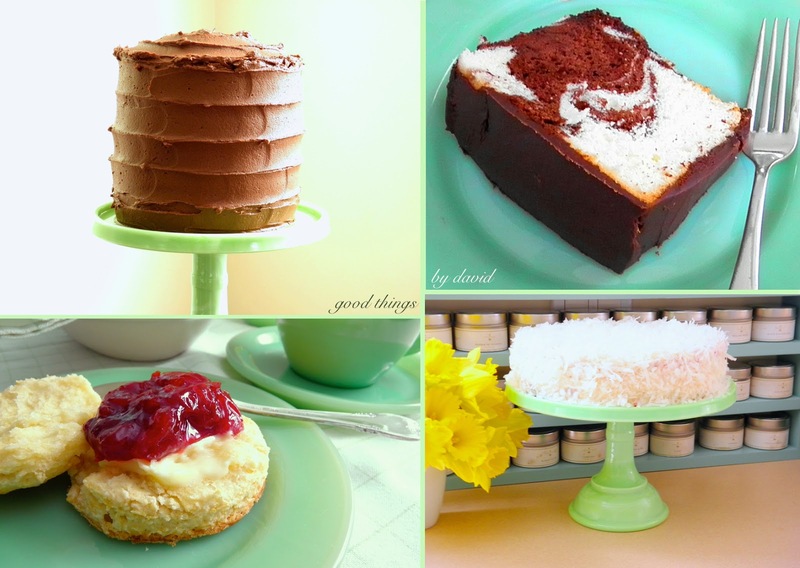 This photo shows a clear cake stand on top of one made in jadeite. The cake stands give a very clear profile of the cake plate as well as the base. 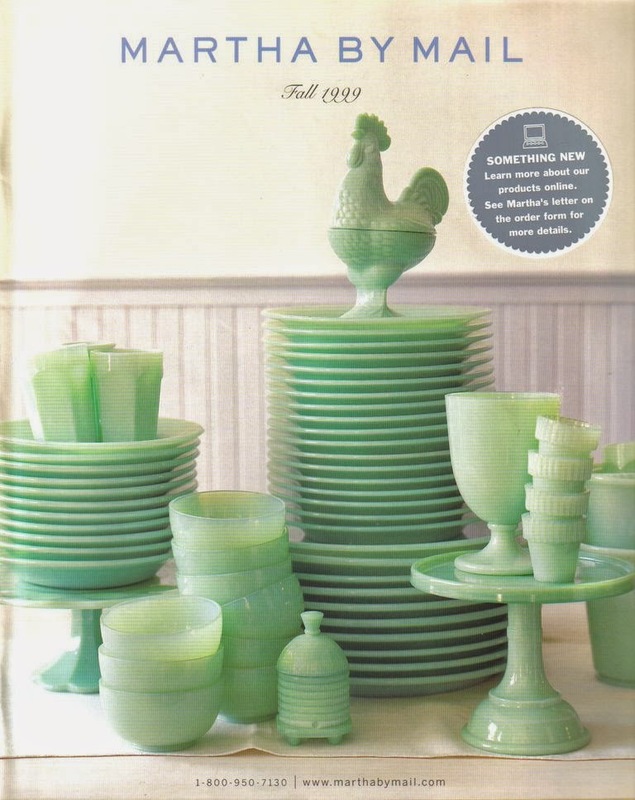 The Holiday 2004 catalog, the last ever to be printed, shows a single cake stand next to the footed 'Dessert Cups'. 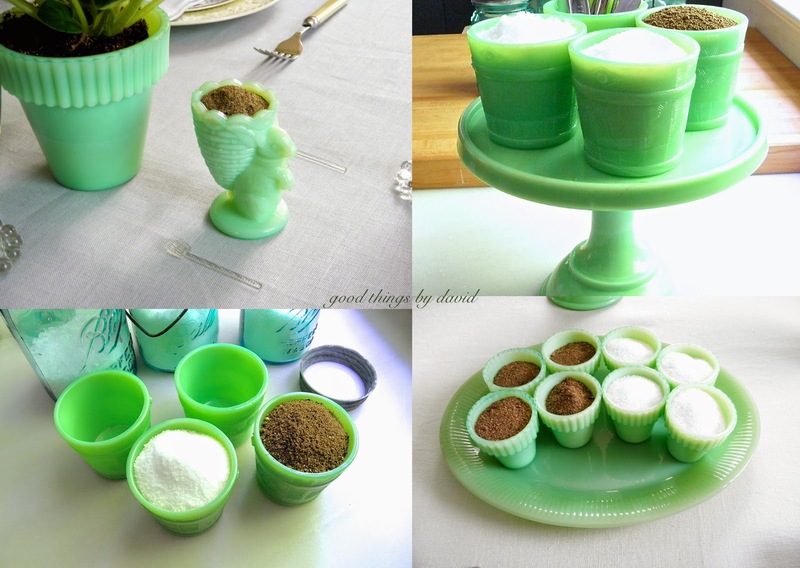 The dessert cups were sold as a set of 4, each measuring 3"H x 4"W.
The green glass is a natural around the holidays. This is from the Holiday 2004 catalog. The Hobnail Dessert Collection includes: Flared Compote (6" W), Dessert Cups (set of 4; 4-1/2" W) and Pedestal Cake Stands (6" W, 8" W or 10-1/2" W). These were some of the last pieces of jadeite that were producers before the catalog folded. 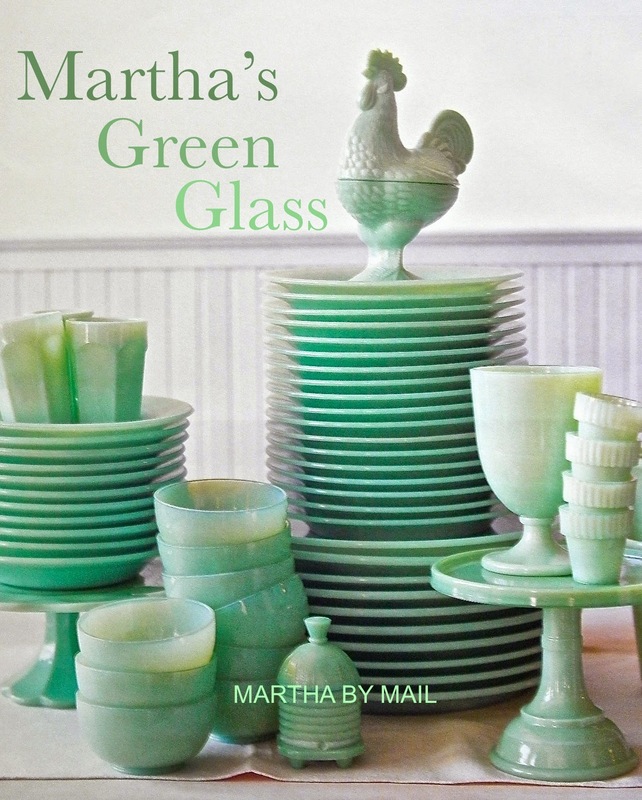 I hope you've enjoyed this retrospective overview of Martha's Green Glass. If you're a budding collector of jadeite and would like to start with some Martha by Mail Green Glass, visit online auction sources and keep your eyes opened at flea markets, antique stores and even tag sales. I've had individuals show me pieces selling for a few dollars! It's good to become familiar with the shapes of the Martha by Mail line. The glorious pieces of jadeite made during this era continue to grace many homes today, because of their enduring charm and quality. The fact that many of these pieces solidly command prices double to triple their original price, suggests that collectors can't get enough of the green glass. It is a testament to its appeal, excellence in craftsmanship and its beautiful, timeless design. 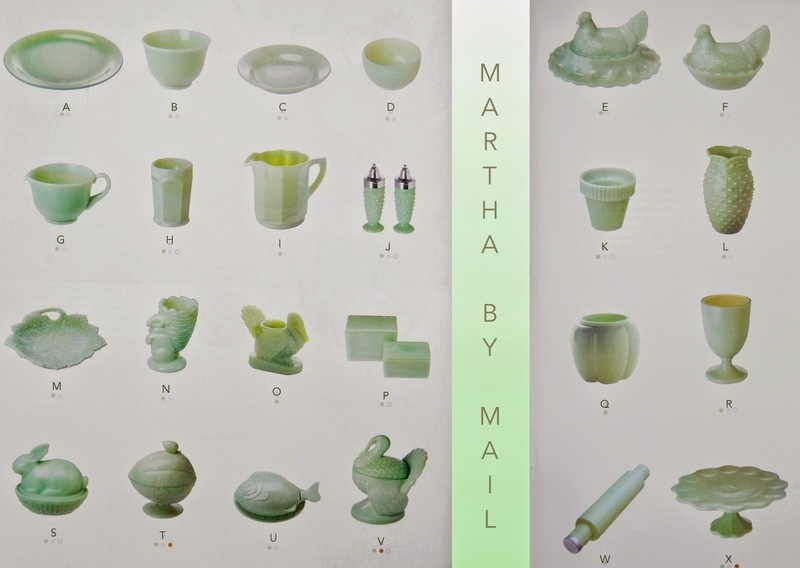 Enjoy collecting your Martha by Mail jadeite!